In a few weeks, relatives will fly into Basel EuroAirport, with arrival time estimated at 9pm. From there, we are thinking about either a car rental or the train to reach Zurich. As the flight arrives rather late, and there is no direct rail link to the airport, can we expect to reach a station by bus then catch a train to Zurich? The general answer is yes, you will have a train at this time. However, the exact answer depends a little bit on the concrete date. During weekdays the last bus leaves the airport at 23:52. Then you have 7 minutes to change from the bus to the train at Basel's station. And your train will be at the main station in Zurich at 01:24. On weekends the last bus leaves the airport at 24:00. Then you also have to change at the station in Basel and you're in Zurich around 01:58. If that is too early for you, you can also wait for the first bus which leaves around 05:10. Obviously the answer to this question also depends a little bit on where exactly you want to go in Zurich. The trains are all for Zurich main station. If you have to travel on from there, chances are high that there are no connecting trains during weekdays. On the other hand, during weekends (Friday / Saturday nights), there is a 24h public transport service in whole Zurich. (Be aware that this trains and buses, called Nachtnetz in German, cost additionally 5 francs). To check the schedule by yourself, use the excellent homepage of the Swiss railroad service. You can unfortunately not book it directly through this website. You can book the train on the Swiss train website and for the bus, the airport has a page with links to local bus network website. Not the answer you're looking for? 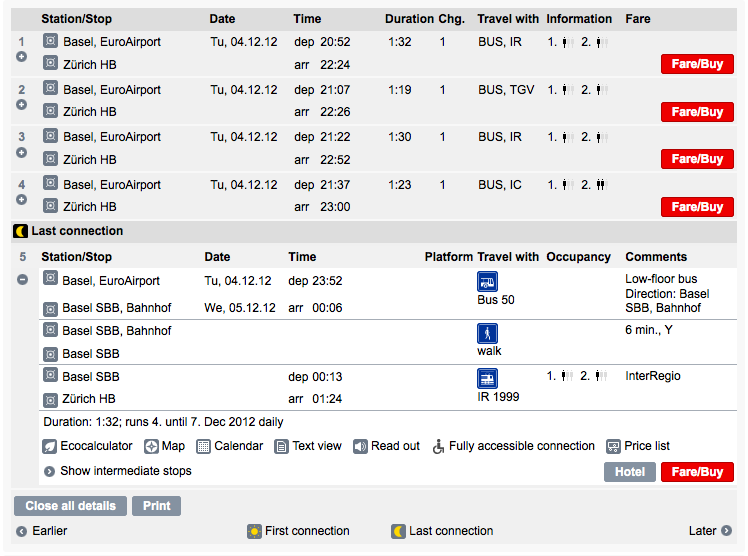 Browse other questions tagged trains switzerland airport-link late-arrival bsl or ask your own question. Mount Pleasant, Iowa, USA — how to get from the Amtrak station to the Burlingon Trailways bus stop? Do I need a visa to travel from Basel EuroAirport?